"you will waste time and money in the end"
✅ Trip Verified | My husband and I booked our flights months in advance because they were such a great price. Leaving from Pittsburgh, the flights were only 299 USD with cancellation protection. It is a month before we are scheduled to leave and WOW air cancels both our leaving and returning flights. Most airlines that I fly with offer you a lateral alternative so that some indemnity is given to the customer. Not in this case. WOW air only presents customers with two offers: to cancel for a full refund or to cancel and receive a gift certificate worth the cost of your trip and an additional 25%. Although this seems like a nice offer, the tickets to fly out of Boston or New York (as they have cancelled all of the flights from Pittsburgh) are twice the price of what we originally paid. I think WOW air is betting on the fact that customers will have made reservations and would be hesitant to cancel. What a racket. My best advice would be to never book with this company as you will waste time and money in the end. I made some non-refundable accommodations that will now go to waste but in my mind its better than playing into WOW air's deceitful marketing strategy. ✅ Trip Verified | Toronto to Copenhagen via Keflavik. Rates were very cheap, I paid for a little extra leg room (still cheaper than the competition). Staff service was excellent, friendliest crew I've met yet. There are luggage requirements that must be met or you pay for extra baggage, do your homework and measure your luggage, no issues here. Meals are not included in the price of the ticket, but food is available in flight at a reasonable price. "turned out to be very expensive"
✅ Trip Verified | Toronto to Keflavik. It supposed to be cheap but they charge for every single thing. It turned out to be very expensive. I don't recommend. Called support due to an issue and they did nothing. Horrible customer service. I had to call many times to get something back. We ended up paying more than any other airline. "disputing the amount I paid"
Not Verified | Los Angeles to Keflavik. I purchased a flight in May of 2018 for a flight in March 2019, I have been checking periodically to see if the seats are filling up. I purchased through a third party vendor and apparently it is only for the economy fare, so no luggage or seats. So I have been watching to see if I need to purchase them early. I haven't been able to see the seats since November, so in February I emailed customer service to ask why. They told me because my flight was cancelled. I guess they do not fly out of Los Angeles anymore, much to my surprise because my flight is in 3 weeks. No one ever emailed me or called me to notify me, I would have been at the airport and had a big surprise. Now I am trying to get a refund and they are disputing the amount I paid, they do not want to pay me approx $300, even though I have sent over screen shots of my credit card showing I paid a total of $1300. It is ridiculous. "never fly with WOW again"
✅ Trip Verified | Paris to Detroit via Keflavik. This was my first time flying with wow. I flew with them initially because it was really cheap. It ended up not being any cheaper then any other airline in the end. I knew I had to pay for my bags but I didn’t look into how much. I didn’t pay for my bags before because I had an oversized bag and there was no option to pay for that. My 45L pack that I always bring as a carry on for every other airline was not allowed to be a carry on for wow. So I had to pay for 2 bags which costs me $150 USD each way. I was shocked by this. After paying this hefty fee, on my way home my bag got lost. The system was down so the lady said she would email me what my bag reference number would be. She did not. I had to email her only for her to tell me that they had no idea where my bag was. I told them I was going on a trip to Hawaii and they said that they would ship my bag there to me. I said absolutely not as my bag was a massive ski bag with miscellaneous other gear in it that I did not want to lug around in Hawaii. One thing that was in my bag that I needed was my hiking shoes. I had to buy a new pair for $200. While I was in Hawaii I kept asking for updates on my bag and they just stopped answering my emails. I come to find out that they actually shipped my bag to my house and never told me. My bag with over $2000 of gear was sitting on my front porch in the rain, while I was in Hawaii. I was lucky it was not stolen. I will never fly with WOW again. They have not offered me any sort of compensation for the massive inconvenience they have caused me and basically have just ignored my emails. "I give them a poor rating"
✅ Trip Verified | We were scheduled to fly from Newark to Reykjavík and then from there to Dublin on WOW Air. As many know this company is low budget and a cheap way to get to Iceland and some major cities in Europe. We paid for upgrades seats so we weren’t cramped and also got the fare that included a carry on and a checked bag. While we were in the front of the plane if you don’t buy priority boarding passes it’s basically a free for all to board. At that point we sat on the plane and waited for two hours until they tried to figure out what was wrong with a “sensor” on the plane. They deplaned us after two hours. We sat in the terminal for another hour. After that. We waited and it was becoming clearer that we would not make our connecting flight to Dublin. 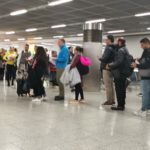 No one on the ground knew the results and what would happen when we got to Iceland and with limited flights out of that airport the choice was do we wait out WOW or get on another flight in Newark on another airline at our cost. So ultimately WOW canceled our flight. As I was on the phone waiting on the phone I got a flight on Aer Lingus direct to Dublin and since WOW canceled our first flight they gave me the option. To cancel the whole round trip flight for my whole family. Which I did. They also said that they would credit me the money for our hotel to stay in Newark for a flight the next day. So I have to submit that claim later today. While I am paying more for my flight to Dublin now I’m not out the money to WOW as I have an e-mail confirmation of the flight cancellation and refund amount. So if they try to not refund me I can dispute the charges to my card. Some other notes the customer service people on the 800 number knew the flight was canceled before the people at the checkin desk. They also sorted me on to another plane 2 days later which would have really screwed me up for the trip. The day delay was not a super big deal. Also with limited options to Iceland I’d be careful booking tours in Iceland before you arrive. Folks were flying to Iceland and had these expensive tours booked and they were going to be out tons of money. While ultimately WOW made it right and I’ll get my money back I would not recommend them at all. However, with limited choices to Iceland if you must fly them to get there wait or give yourself an extra 24 hours before booking those expensive tours that might not refund you the money if you don’t get there. If you are just stopping over and connecting in Iceland to another destination with WOW Air pay more and get on one of the larger carriers. They have larger fleets to add flights and put you on other planes. The person at the WOW desk also was very clear that they have no relationships with other airlines. They won’t be able to get you on another flight out of your airport unless it’s a WOW flight. Unlike say Aer Lingus who has a relationship with Air Canada, etc. For all this I give them a poor rating. "Do not use this airline"
✅ Trip Verified | Newark to Dublin via Reykjavik. They hook you with cheap fare. Average size carry on luggage 70USD each way. No free meals, no screens but they will charge you for use of a tablet. No free tea or coffee. $3.25 per cup. If you think that purchasing a ticket will save you money you are wrong. Everybody complained about the cost of a bag ($150 round trip). Never before have I traveled with people who were openly critical of the airline before take off. Seats were not comfortable. We ate nothing, drank nothing, watched nothing, listened to nothing, no internet. Be prepared to pay far more than expected. Do not use this airline. "continued to ignore our complaints"
✅ Trip Verified | Toronto to Barcelona via Keflavik. We never did get to fly with this airline but seeing other reviews of the actual flights, glad we didn't. Our horror story is all about their customer service and flight cancellation process. We had flights to Barcelona and discovered after we called them to look at extending a layover, that they were in the process of reviewing the flight and it likely wasn't going to fly. We were misinformed on multiple occasions about how we could seek compensation for the additional cost of another flight this late in the game. Long story short, they have continued to ignore our complaints (both written and over the phone) and have yet to compensate us as they should. Will never recommend WOW air to anyone. ✅ Trip Verified | Baltimore to Keflavik. Absolute awful check in process. Only had one check in agent to check in over 50 people. If you do book, you must give yourselves two hours just to check in. The customer service at the check in desk was awful and unhelpful, in no rush to accommodate passengers. Not Verified | Orlando to Amsterdam via Reykjavik. Like many people here, we booked several months in advanced and our flight got cancelled few weeks before departure. Without any reason. Wow Air offered an alternative; flying two weeks later or fly from New York rather than Orlando. Both weren't realistic and the customer services agent agreed. We had our hotels, rental car, events, etc. already booked. Since it was in the beginning of January, it cost us an additional 600 euro to fly home with another airline. Hours later than we originally planned.